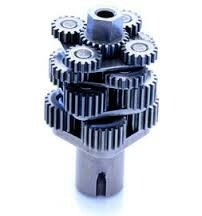 In today’s competitive, globally sourced world in search of the lowest possible price for metal gears to AGMA 8 standards, conventional Powder Metallurgy (PM) is often a superior processing method, providing highly repeatable product at costs typically 30% less than MIM and even lower than a CNC-machined part. ASCO can design, engineer and manufacture powdered gears that are tailored to provide optimum performance in your specific application. Gear forms available in PM include spur, helical, half worm, bevel, miter, sprockets, gear racks and epicyclic gear assemblies (sun, planetary and carrier). 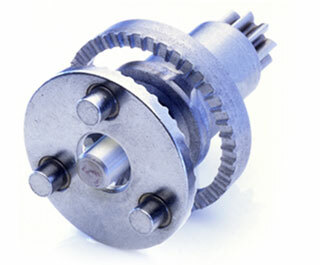 ASCO is assisted by using state of the art gear design software provided by SOLIDWORKS using Gear Trax. PM ( or sintered) tooling (dies, punches and core rods) is manufactured using tool steel and/or carbide by wire EDM. During assembly they are ground, fit and polished to a micro finish with tolerances as tight as 0.00015”. This tolerance is necessary so that the powder will not bind the tooling. Powdered Metal Tooling of this precision will produce parts with the same degree of precision. So rather than CNC machining parts individually across potentially several set-ups, the PM tooling provides consistency of involute form and its relationship between pitch diameter and the outside gear diameter. Since “Total Composite Error” (TCE) and “Tooth-Tooth Error” (TTE) measurements are controlled by the tooling, the same degree of accuracy is realized to AGMA 8 Standards. Using hard tooling for gear profiles has another benefit in that the gear measurement specification can be designated as the static measurement over wire (MOW) or the more dynamically favored test radius (center of gear to Pitch Diameter). These can be independent of one another allowing adjustability in the circular tooth thickness. ASCO Sintering Co. uses the principles of SIX SIGMA/Lean Manufacturing with (16) Green Belt Engineers staffed at all levels of the company. Gear quality is measured dynamically on a Vari-Roll gear-testing instrument utilizing master gears certified by the National Institute of Standards and Technology. This system using the Vari-Corder can provide a written record of the gear data. 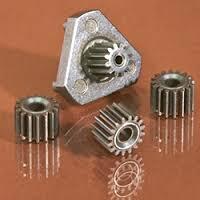 Many gears produced by ASCO have been able to be certified to AGMA level 8 standards. If your requirement are to net shape AGMA level 8 please contact us. achieving the extreme precision required for an AGMA 8 rated Gears is available.